Thanks to a $2.6 million grant from the John Templeton Foundation, Emory University is preparing to launch the Emory Integrity Project (EIP), a comprehensive effort to promote and develop a culture of ethics and integrity throughout Emory's undergraduate experience. The EIP, a joint project of Emory's Center for Ethics and its Division of Campus Life, is intended to make Emory a national model for integrating ethics and integrity in undergraduate life, says Paul Root Wolpe, director of the Center for Ethics and project leader of the grant. "The goal of the Emory Integrity Project is to make ethics and integrity a narrative theme that carries throughout the four years of the Emory undergraduate experience," he says. Robin Forman, dean of Emory College of Arts and Sciences, notes that "a liberal education has always been understood to have among its goals that of promoting ethical thinking." "The Emory Integrity Project raises interesting and important questions about the forms that an education in ethics and integrity can and should take in the context of the modern liberal arts research university," he says. "I am looking forward to seeing how the project develops, and its impact on our students, as faculty become more involved in the project." For Ajay Nair, senior vice president and dean of Campus Life, the project offers another way to put the university's vision statement into action. "Emory's vision statement elevates ethical engagement to a central place in the university's self-concept," he says. "Our distinctiveness makes Emory the ideal place for living out the vision of what academic engagement and student transformation in a residential setting can be." Integrity is most commonly understood as holding true to those values that constitute one's moral identity, or as holding steadfast to commitments, explains Wolpe. "But it is much more," he says. "It is an integration of your morally and ethically grounded convictions that are developed and maintained by sustained reflection and realized through moral courage and action. That is why the university is such a fruitful place to explore those convictions, at a time in the life cycle when students are solidifying their moral identity." Creation of a campus-wide discussion on a "culture of integrity," beginning with a student-led reimagining of Emory's approach to honor and integrity that will ultimately lead to programmatic and cultural changes throughout the university. A yearly theme on some aspect of ethics and integrity, reflected in a new common reading program. Every incoming student will be sent a common reading over the summer before arriving at Emory, which will serve as a basis for a year-long series of discussions and programming on that year's theme. The 2016-2017 year-long theme and chosen reading will be unveiled at the EIP opening event on Wednesday, Jan. 27, at the Center for Ethics. The common reading will be integrated into a number of first-year seminar courses. About 50 first-year seminars are offered at Emory, and every first-year student is required to take one within the first two semesters. The small-enrollment courses cover nearly every discipline and allow students to work closely with the faculty member teaching the course. "This is a partnership of both classroom and curricular components that brings integrity to the forefront of the Emory undergraduate experience as not just an intellectual concept, but a lived value," says Elizabeth Cox, interim senior director of the Center for Community Engagement and Campus Life. The EIP will bolster already successful programs for first-year students at Emory such as the university's signature Health 100 course, required of all freshmen in their first semester. Health 100 aims to enhance student appreciation of personal well-being with focused activities involving reflections on values and strengths in the context of goal-setting around health behaviors. The collaboration will extend these efforts. Another hallmark of the project will be the integration of a Personal Integrity Plan for each student's co-curricular experience and as part of the Health 100 course. Peer mentors will work with students to help them articulate personal growth goals over their four years at Emory. The project will provide opportunities for students to revisit, reflect on and recommit to their integrity plans throughout their time as students. "This plan puts integrity into action as students participate in leading organizations, service learning, and engage difference across our community," says Cox. "Engagement in the community can be one of the experiences that influences students' values the most." 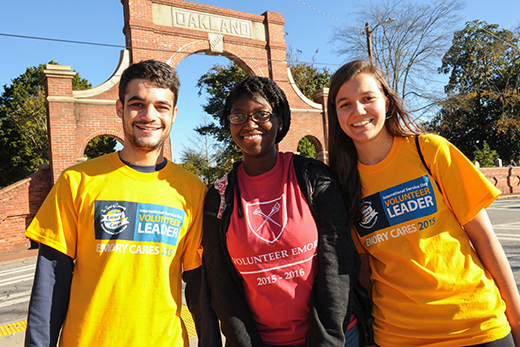 Through the EIP, the university will expand even further the number of students involved in community-based learning through a variety of successful efforts already on campus such as the 33-year-old Volunteer Emory program, LeaderShape® Institute, the Ethics and Servant Leadership Program, and Vision in Action. "One of our goals is to make the diversity of programs and experiences at Emory more available and inclusive so that all students will touch at least one during their career at Emory," Cox says. The project has hired a team of external experts who will undertake an extensive evaluation process and assessment plan at every stage of the effort, says Wolpe. "We expect the EIP to have an impact beyond the transformation of one university culture. If the EIP is to serve as a model for other universities, it is important to secure an objective, independent assessment of the project's strengths and weaknesses," he says. The project sounds ambitious, and it is, Wolpe adds. "One product of the EIP will be curricula so that other colleges and universities can duplicate or adapt the EIP model to their campuses. We want the EIP to provide a template for using integrity as a unifying and integrating theme in higher education."